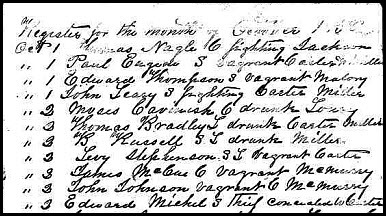 In the first week of October 1858, some 48 men and women were arrested in the City of Memphis, Tennessee, and their names and their alleged offenses carefully inscribed into the blotter of the Memphis Police. John Leary, on October 1, 1858, fighting. Edward Michel, on October 2, thief. Patrick Ward, on October 4, drunk. Thomas Numan, on October 7, disorderly. Eight for fighting. Four for disorderly conduct. One thief. A bunch of drunks. But by far the biggest group rounded up: the vagrants. Some 19 people — all male — all arrrested in those first seven days of October 1858 — all charged with the same offense. They were vagrants. Things hadn’t changed much by the time the Memphis Police Blotter was being created in that first week of October 1858. The statutes in effect at the time tell us exactly what a vagrant was in 1858 — in other words, if we find our ancestor’s name in that police blotter, we know exactly what he (or, in some rare cases elsewhere in the volume, she) was being charged with. In short, idling and loitering about without any clear occupation was going to get you locked up. And doing it twice was a major mistake. Found my great great great uncle’s firm mentioned, as one of their employees stole a diamond worth $7 from them. LOVE that site! Used it a lot several years ago when I was researching that particular uncle. That’s terrific! And yes, it’s a truly great site.